UK house prices ended 2016 up 7.2% (provisional) despite London house prices weakness that according to the Nationwide increased by an average of just 3.7%, near half the UK rate. This illustrates why so many housing market analyst / journalists got UK house prices so badlty wrong for 2016 as they mistakenly latched onto London weakness as sign for a imminent UK housing market bear market or worse a Brexit CRASH After all the consensus view was that if London was weak then the rest of the UK would be suffering far worse. This view was liberally regurgitated across the mainstream press all year. Whilst my comprehensive in-depth analysis of over a year ago concluded that whilst I expected London house prices weakness during 2016. However this would NOT impact significantly on average UK house prices as London during 2016 would effectively pass the UK house prices bull market batton to the regions that I expected would outpace London and thus lift the average house prices higher so as to ensure a continuation of a strong UK housing market during 2016. And so the establishment media and institutions such as the IMF and OECD peddled propaganda of expectations for a UK housing market crash right into referendum voting day if the people of Britain voted for freedom. A Post-Brexit House Price Crash Is the Real Danger for the U.K. Even so, the resulting impact on house prices was "not certain". ... Generally, investors have expected the UK housing market to be hit by any slow ... has not been a crash in property prices since Brexit, more of a soft landing. Brexit is going to kill house prices, says the Royal Institute of Chartered ... analysis, stressed that a Brexit would reduce UK house prices. 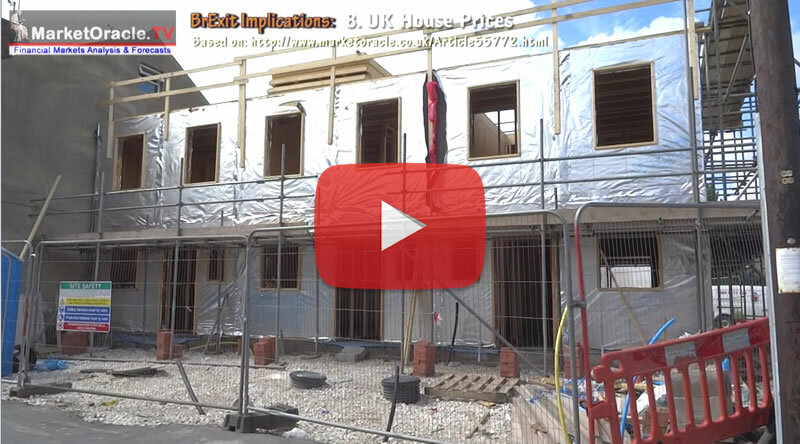 For more on why the mainstream media does not understand the primary drivers of the UK housing bull market then see my comprehensive UK housing market analysis video in the implications of BrExit series. The most recent UK average house prices provisional data for December 2016 (£218,671) is showing a 5.6% deviation against the forecast trend trajectory, which if it continues to persist then in terms of the long-term trend forecast for a +55% rise in average UK house prices by the end of 2018 would then translate into a 9.4% reduction in the forecast outcome to approx a +46% rise by the end of 2018. In the run up to BrExit I expected momentum at the time to slow from 8.7% for a few months after BrExit to 5% before rising again towards 10% by the end of 2016. What actually transpired was momentum falling to +4% in August before rising to end the year at +7.2%. So house prices trend turned out to be weaker than expected which is not surprising given the series of post Brexit political events that have subsequently transpired as Britain now awaits Article 50 to be triggered by the end of March 2017. Nevertheless the trend going into 2017 continues to favour rising UK house prices during 2017. The FTSE ended 2016's last day of trading at a NEW ALL TIME high of 7,142, which according the mainstream financial press's reporting for virtually the whole year was an IMPOSSIBLE outcome. After all the surprise BrExit EU Referendum vote result was supposed to have heralded a crash, collapse, recession new bear market, NONE of which materialised! As for a taste of what's in the store for the stock market for 2017 then see my recent video analysis posted right the recent peak of the Dow, on the day it touched a new high of 19,987, that warned "These Stocks Bull Market Delights Can Have Violent Bear Market Ends" and why I was seeking to sell 50% of my stocks portfolio. Ensure you are subscribed to my always free newsletter and youtube channel for forthcoming analysis and detailed trend forecasts aimed at capitalising on Trumps Coming War on China amongst other mega-trend drivers. could you also post a graph of UK house prices against dollar or a basket of currencies of most important UK trade partners? It will show that house prices are still way below 2007 peak. Yes in hindsight you can pick any other market that has gone up and say look against this it has fallen. But unless you saw it say 3 years ago and then acted to capatailise on it at the time then whats the point ? Afterall you can say the same for anything, which is what bears tend to do, the dows gone to 20k so lets see if we can find soemthign thats gone up more and say look against xandiium prices the Dow has not gone up so stocks are in a bear market! The ONLY price that matters is in ONES DOMESTIC CURRENCY, all else is basically worthless comparisons, well unless your domestic currency is like the Zimbabwe dollar, then I suppose it matters. 99.99% of UK citizens don't buy properties on the basis of what they think sterling will do against x,y,z unless their earnings in totality are in those currenciess. So yes whilst it matters for foriengers, as they price assets in THEIR OWN DOMESTIC CURRENCY, it makes near zero difference to UK citizens. For instance, even though I have a footprint elsewhere in the world, I price assets and percieve wealth in my DOMESTIC CURRENCY - sterling, it does not mean anything what the exchange rate is in terms of that, only in terms of when I physically buy something priced in dollars etc, and not the value of property that I bought 5 years ago. Now if I were liquidating my property to move to the US THEN it would matter, but only then. So No, it does not matter for most holders of UK property what the US, Aussie or Zimbabwe dolllar is going.